Make a joyful noise unto the Lord . . . At FUPCDC music is an integral part of each worship service. We believe that in praising God through singing, ringing, playing or simply listening, we can deepen our connection with the Lord. The Chancel Choir provides musical leadership during the traditional 8:30 am worship service. They lead and encourage the singing of hymns, as well as present anthems of prayer and praise. At other times during the year, small ensembles and soloists provide inspirational music and at times the Chancel Choir joins in accompanying the other FUPCDC musical groups. 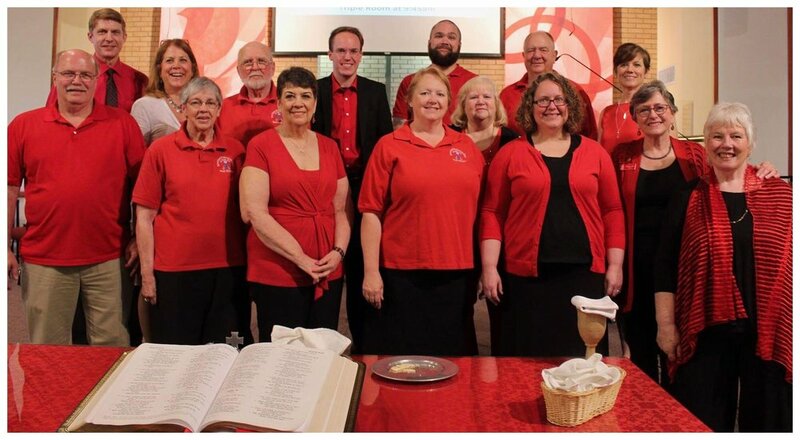 The choir practices on Wednesday evenings at 7:00 or 7:30 pm in the sanctuary (click on the season schedule). For more information, please contact Dana Van Slyke at music@fupcdc.org. We are always looking for more voices to join us in singing praises to God. Our praise group of instrumentalists and vocalists provides worship leadership at the contemporary worship service at 11:00 am Words to the music are projected on the screen and all are encouraged to sing and enjoy praising God through music. Children's Choir is open to Elementary School-aged children under the direction of Becca Anderson and Chris Anderson on guitar. Rehearsals are held weekly on Thursdays from 6:00-7:00 pm in the Sanctuary. Performance for worship services is scheduled several times throughout the year.